The Creative Compass is less a how-to on writing craft and more about nurturing the writer within and finding the inspiration to discover the truest version of your story. Part personal essay with the authors sharing their own writing journey, part guide to a structured approach to writing, and a large part inspiration, it is like having a writing coach in the palm of your hand. •	The Dream stage is when the writer finds his/her way, having a dialogue within, imagining possibilities to find that one “sticky” idea that propels the writing forward. •	The Draft stage is creation—layers of writing that result in an early draft of telling the story. •	The Develop stage is the painstaking process of shaping and cutting—finding what the authors call the story’s golden thread that defines what happens and why it must happen. •	The Refine stage involves feedback and editorial support to find exactly the specific detail and word to reveal the heart and essence of the story. Throughout each stage, there is practical advice to help focus and motivate the writer, and also supportive acknowledgment of the struggles, self-doubts, and rejection that are part of the writing life. In addition to their own experience, the author’s quote numerous writers, drawing upon their vast experiences to show the complexities, heartaches, and rewards of the writing life. Dan Millman and Sierra Prasada are father and daughter. 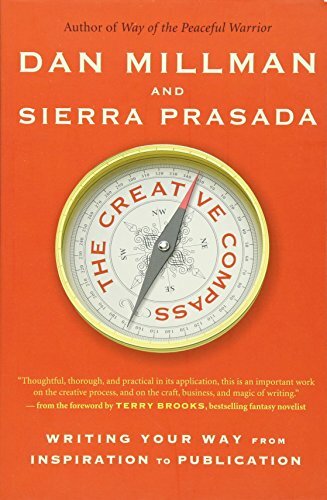 The Creative Compass is a culmination of years of their writing experience in fiction, nonfiction, journalism, theater, and film adaptation. It’s an inside look at decades of their reflections on writing, and its tone is conversational and engaging. The book reads like a series of personal essays, and while the stages presented are linear, it’s the kind of guidebook you can open to any chapter at random and find inspiration.